Destroyed. is the tenth studio album by American electronic artist Moby. It was released on May 13, 2011 by Mute Records. Moby announced the title, track listing, and release date of the album on his website on February 15, 2011. A photography book of the same name was released in conjunction with the album. 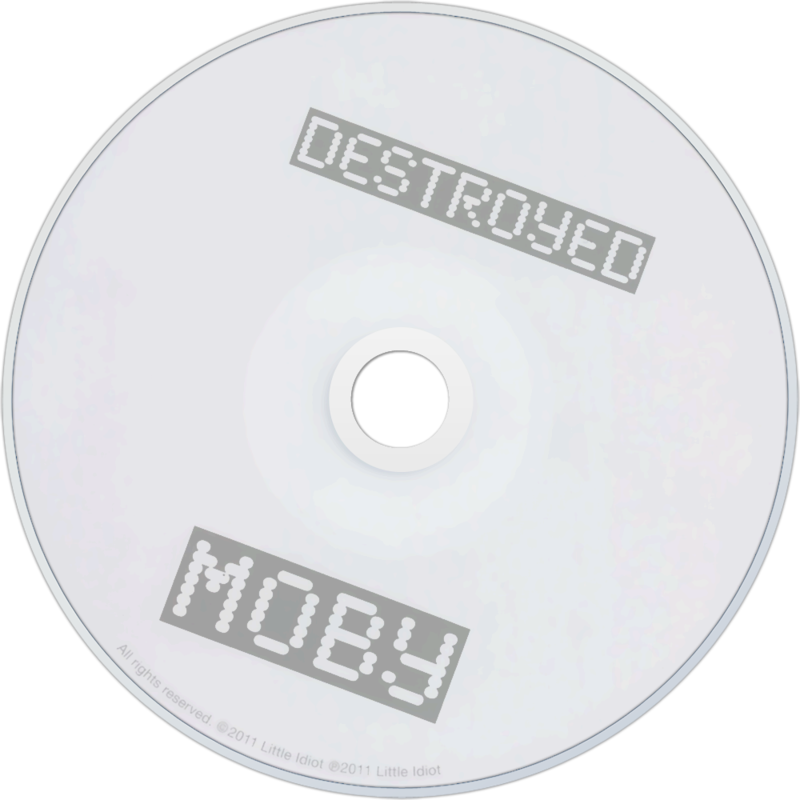 On October 31, a deluxe edition of the album was released, called Destroyed Deluxe, including, beside the standard CD, a full disk of new music, a DVD with videos and exclusive festival footage, and a 24-page booklet with new photos taken by Moby. A free download of one of the new songs included, "The Poison Tree", was released on the album's mini-site. It was first released as part of the Download for Good compilation in support of the David Lynch Foundation. Something that BBC Four's recent tribute to the astonishing musical developments of 1991 has thrown into focus is that the rave generation was never built to last. Good thing nobody told them that, eh? If they had, we'd have been denied all kinds of Prodigy magic, modern clubbers wouldn't squeak with glee at the merest hint of a rejigged old-school classic, and we certainly wouldn't be sat here enjoying the 10th Moby album. You'd think he'd be more celebrated for reaching such a landmark. Instead, he tends to find critical affection blunted by the triple whammy of ubiquity, dilettantism and a lack of quality control. This isn't wholly fair: the first charge may have applied in the immediate wake of Play, but hasn't exactly been the case since; and the second isn't a pejorative as such (in fact, that anyone could have Thousand, That's When I Reach for My Revolver and Porcelain on their CV is wholeheartedly laudable). And the third? Well, after the disappointment of Wait for Me it's a relief to say that's being addressed, and with some style. This isn't Moby at his danciest, though. Instead, this set recalls the work of another titanic electronic Richard, namely Aphex Twin's underappreciated Selected Ambient Works Volume II. Like that record, Destroyed is a curiously sprawling affair, heavily reliant on tone and texture and located squarely in its own hazily delineated environs. It doesn't so much spring into life as pad into focus, with opener The Broken Places soldering blurry melancholic chords onto a percussive heartbeat; later, the astounding Stella Maris dispenses with beats altogether, wandering with disconsolate desperation around an ancient and elegant church before being bathed in a corona of redemptive strings. When You Are Old casts Mr Hall as a luridly caped conductor, straining over devastating organ hypnosis even as he encourages a fiercely-restrained orchestra to chime gnomically in. These are among the most beautiful works he's ever produced. But that still isn't enough, and so it is that the ravenous, ramshackle pop instincts that have led Moby down so many curious paths kick in, in intriguing ways. He may never have claimed much kinship with shoegaze in the past, but After, The Day and Lie Down in Darkness, though sadly not appearing in quite that order, serve as an evocative instruction and a deliberate hurtle away from a vocalised meaningfulness. This attitude bears further fruit via the cracked robotics of Be the One, Blue Moon, and the relentless drum crescendo of The Violent Bear It Away, which takes both piano and rave dynamics and strands them somewhere within earshot of Zola Jesus. All in all, Destroyed feels like both a return to the darkness from which Moby emerged in the first place, and perhaps his most year zero offering to date. Alright, so that year might actually clock in somewhere around the two-decades-ago mark; but, contrary to all expectations, that actually looks set to render this among his most enduring endeavours yet.